Army veteran Jack Gilsdorf, left, claimed the first pheasant of the day at the 2017 Fulton County Sportsmen Club’s Veterans Day Pheasant Hunt. Brian Mitchell, right, Fulton County Chapter of Pheasants Forever, acted as guide and dog handler for the group. The free event for veterans will begin with breakfast at 7:30 a.m. at the Sportsmen Clubhouse, 7700 County Road 14. The hunt will be held 9 a.m.-noon, and lunch will be provided afterward. Ammunition, orange hunter caps, guides, and bird dogs will also be provided. Participating veterans must bring a valid hunting license and their own shotgun. Funding for the hunt is provided in part by a grant from the Ohio Division of Wildlife. For more information, and to reserve a spot, call Greg Ruger, Sportsmen Club president, at 419-583-7662. Veterans from all counties are invited but only 25 spots are available and Fulton County veterans get priority reservations. 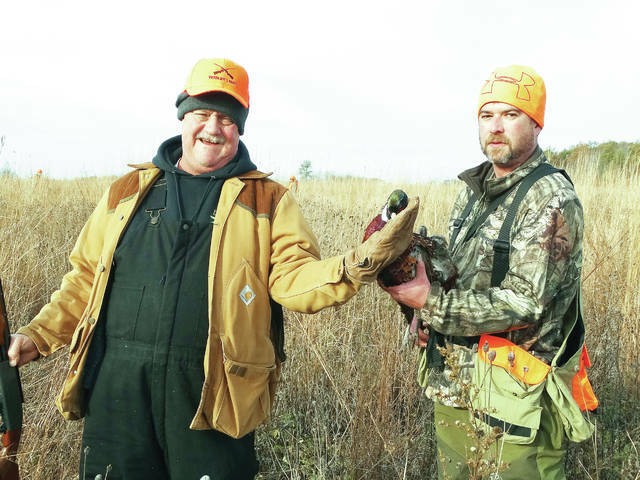 https://www.fcnews.org/wp-content/uploads/sites/45/2018/10/web1_pheasant-hunt.jpgArmy veteran Jack Gilsdorf, left, claimed the first pheasant of the day at the 2017 Fulton County Sportsmen Club’s Veterans Day Pheasant Hunt. Brian Mitchell, right, Fulton County Chapter of Pheasants Forever, acted as guide and dog handler for the group.